is neck is as thick as a tree trunk, his hands as course as sand paper. Today, Steve McBee is the owner of the Lan-Tel Communications Co. in Independence. Once upon a time, Steve McBee was the owner of a lot of black eyes and respect among his peers. “I admit, I used to know a thing or two about fighting when I was a kid,” he said. “If my husband wouldn’t have been with me when that dog attacked me, I’d be dead and buried right now – and that’s a fact,” said Kristi McBee, the mother of four boys. Her left arm is a zigzag of 60 stitches. On the evening of Sept. 17, it looked like a decimated slab of beef. n this particular evening, Steve McBee decided to join his wife on her nightly jog – something he did about once a week – through their rural Jackson County neighborhood east of Fort Osage High School. The jog led them northeast along North Juanita Drive, right on North Elsea Smith Road, then a quick left on East Rogers Road. Next, they took a right on Douglas Road, which becomes Hoover Road after it intersects Allen Road. On the west corner of that junction sits a house that is different from others on the block; it’s a house rife with peeling paint, overturned glass tables – and a badly rusted chain link dog pen. The couple continued south on Hoover Road before turning back a half mile or so before the road merges with U.S. 24. Usually, they would have pushed on to U.S. 24, but not tonight. “One of our boys had to have his football pictures taken a little later,” Steve McBee said. The two of them were making pretty good time when they came upon the final stretch of Hoover before it turns into Douglas. “She was workin’ me pretty good,” Steve McBee said. Kristi McBee looked at its collar. She looked for a chain. Then, it burst forth with the velocity of a cannonball. wo years ago, the same mastiff attacked Joyce Shelley as she and her husband were walking down Hoover Road. The dog emerged from a metal screen door and, after a lightning sprint, plunged its jaws into her arm. After four surgeries to repair tendon and nerve damage, Shelley still has scars from the attack. Her right hand will never fully recover. The dog was quarantined for five days and released back into the custody of its owner, Christopher Ownbey. Ownbey was told by Jackson County authorities to make sure the dog was chained from now on. According to county law, after a first attack a dog is only tagged as “dangerous.” A second attack must occur before any legal action is taken. For the past two years, everyone along the 2900 block of Hoover Road has been cautious – extra cautious. No one played in their yards. Returning home, residents would hug their vehicles as close to their doorways as possible, dashing indoors at their earliest opportunity. The welfare of the neighborhood lay in the capability of a chain to contain the might of a 200-pound mastiff. Don’t move!” Steve McBee screamed, attempting to shield his wife from the hard-charging canine. But Kristi McBee did move, and the dog came for her. It lunged high, aimed for her throat. She threw up her left forearm to protect herself. And it wasn’t about to let go. The dog landed on the ground and began to tug, throwing its head from side to side – tossing Kristi McBee around as if she were made of straw. Steve McBee knew he had to intervene, and he did. He pried back the dog’s jaws, offering his left wrist in lieu of his wife’s forearm. The dog accepted, then it released and dug its jaws into his calf. Then it let go again. By this time, Steve McBee was bloody and beat down, or so the dog thought. The dog backed up and sprung for his jugular, but Steve McBee was able to fend the dog away with his left hand. The dog clenched its jaws as tight as a vice. The brawl continued in a shallow ditch alongside the road, where Steve McBee pinned the dog, slowly strangling it with its own collar. But then the collar – Steve McBee’s lone source of leverage – began to come off. Little by little, the mastiff was slipping free. risti McBee hurdled two barb wire fences to alert a neighbor. When she returned with help, she feared the worst. “I didn’t think there was any way my husband could have survived,” Kristi McBee said. Her head was dizzy from blood loss and her breathing was shallow when she peered down the road after her husband. There Steve McBee was – “like an angel,” Kristi McBee said. And then she collapsed, unconscious. y the time nearby resident Jim Schmidt arrived, the deed seemed to be done. Steve McBee, draped in blood, was standing, and the mastiff was not. Schmidt poked the animal several times with a crow bar, then stabbed it once with a kitchen knife supplied by a neighbor to ensure that it was, in fact, dead. Steve McBee couldn’t resist the temptation any longer. He swiped the knife from Schmidt’s hands and stabbed the dog again and again. “I probably stabbed it 30 times,” Steve McBee said. Following an eight-minute struggle pitting man vs. beast, Steve McBee was victorious. He had suffocated the mastiff to death with one hand as it tried ever-so-frantically to rid itself of the collar that ultimately became its noose. 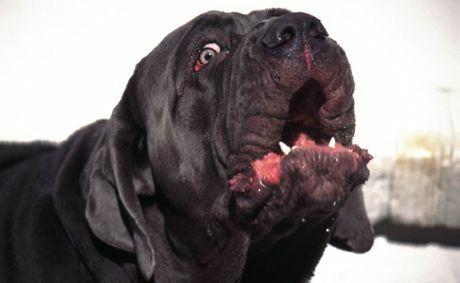 When the mastiff finally did slip out of the collar, the dog dropped lifelessly to the earth. teve McBee is quick to recite a San Francisco case in which the owners of a mankilling canine were charged and ultimately convicted of involuntary manslaughter. Steve McBee’s left hand and half his forearm are encased in a cast. Doctors are telling him he’ll be lucky to regain 70 percent of his mobility in that hand. This after several other surgeries and months of rehabilitation. His left calf, on the other hand, looks like it was dangled in front of a famished alligator. “My limbs or my life?” Steve McBee said. o far, Ownbey has been charged with two misdemeanors, one for not properly leashing the animal and another for allowing the dog to be a public nuisance. Ownbey was unavailable for comment. “He’s nothing but a big bully who’s going to get what’s coming to him,” Kristi McBee said. Neither Shelley nor the McBees have ever heard an apology from Ownbey. In lieu of asking for her forgiveness, Ownbey has harassed Shelley, flipping her the middle finger or verbally demeaning her whenever he has the chance. “If he so much as drives down our road, I’ll be waiting for him,” said Steve McBee, his good hand balled into a fist. Ownbey’s court date for the two misdemeanor charges is scheduled for 1:30 p.m. Nov. 14 at the Jackson County Associate Circuit Court. “We’re bringing his whole neighborhood with us,” Steve McBee said.